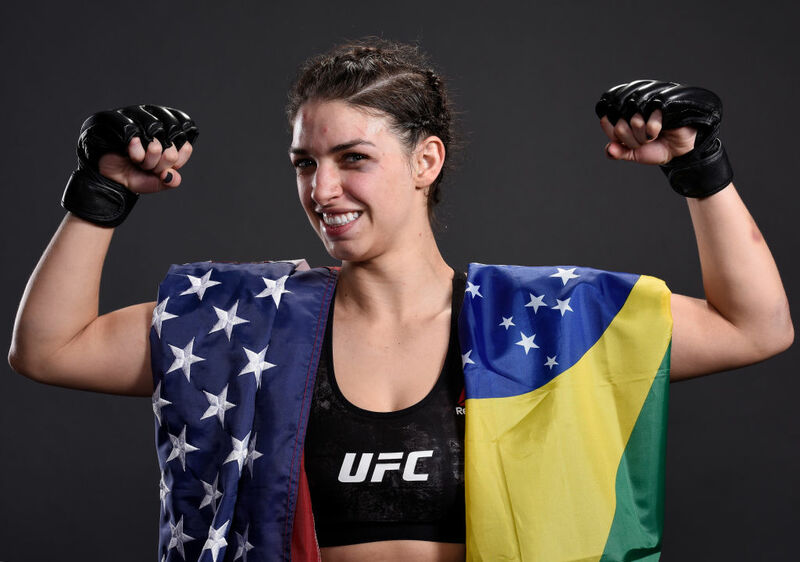 Mackenzie Dern asked to be on Saturday’s UFC 224 fight card in Rio de Janeiro, Brazil following her debut win over Ashley Yoder. An elite Brazilian jiu-jitsu competitor and daughter of BJJ standout Wellington “Megaton” Dias, the 25-year-old rising star identifies as both American and Brazilian and wanted the chance to compete in front of the fans that are sure to pack Jeunesse Arena on Saturday night. One of the people in attendance will be her father, who will be seeing his daughter compete inside the Octagon for the very first time. Between being the daughter of a well-known jiu-jitsu player and having tremendous success of her own from a very early age, Dern spent her formative years and early adulthood in the spotlight, and the intensity has only increased since she began making the transition to mixed martial arts. While most fighters get to make their professional debuts in relative obscurity, Dern’s took place under the microscope and each performance since has been subject to scrutiny. It’s a difficult position to be in for any fighter, as those early bouts are when you’re supposed to be able to make mistakes and progress is more important than perfection. It’s especially difficult when your notoriety outpaces you experience, which is where Dern stands heading into her seventh professional bout. 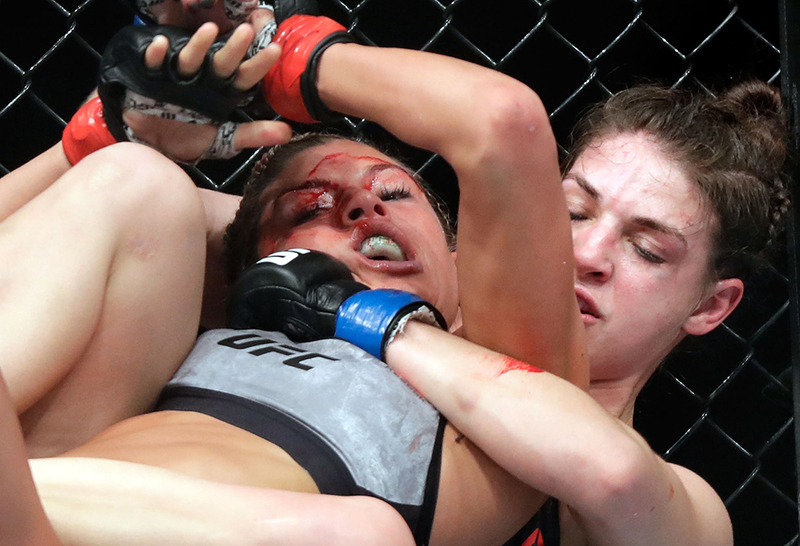 “My first pro fight – I never did amateur – so many people were watching it in comparison to a lot of other fighters that do their first MMA fight,” recalled Dern, who picked up a split decision victory over Ashley Yoder in her promotional debut at UFC 222 in March. “Knowing people are watching, it doesn’t really matter if they’re for or against me – just to know I have all these eyes on me makes me perform way better. That pressure to perform has intensified in the wake of her victory over Yoder and rapid return to the cage this weekend against Cooper, a former TUF finalist who has gone 2-2 in her first four Octagon appearances and has faced much more experienced foes than Dern throughout her career. Not only will Saturday’s appearance in Rio de Janeiro be Dern’s second fight in three months in the UFC, but it continues a torrid pace the Arizona-born fighter has kept since picking up her third career victory over Katherine Roy in March 2017. Out of action for seven months following that bout, Dern returned to the cage in October 2017, signed with Invicta FC and defeated former title challenger Kaline Medeiros two months later and made her Octagon debut this past February. Including that bout with Roy, this will be the submission specialist’s fifth appearance just under 14 months. “I’m definitely aware of it, but I try not to take the critics seriously,” she said of the questions about rushing back into the cage when perhaps more time in the gym would be the smarter long-term play. “It gets to me through the grapevine, but I try not to look at it or pay too much attention to the critics or the compliments. In addition to simply taking the opportunities that have been presented to her thus far, Dern also views the hectic schedule she’s kept as part of her accelerated education in a new sport and a chance to learn important lessons about herself and what she needs to continue working on during this early stage of her career, rather than down the road when the stakes are higher. “I think it’s good that I go through these rounds now instead of going and getting a submission every fight in 10 seconds or 15 seconds and go to a title shot never being through five rounds, never having to push myself to the limit,” said Dern. “Any time I can push myself to the limit, that’s good. I think that’s an important learning experience. “It’s so good to feel like I’m a white belt again with the striking and new things,” she added. “At the same time, it’s also hard because I was on the top of my world in jiu-jitsu and then you have to start the ladder all over again. It’s mixed feelings. And she’s excited to have that boisterous, supportive Brazilian jiu-jitsu community behind her this weekend as she faces off with Cooper, whom she plans on finishing on Saturday night.